Two journalists are on the second day of a hunger strike in front of Hungary’s public broadcasting headquarters in protest against manipulative news broadcasting in the public media. The pair, Balázs Navarro Nagy and Aranka Szavuly, both union officials, are protesting against the blurring out of the features of a prominent judge in a news broadcast last Saturday. 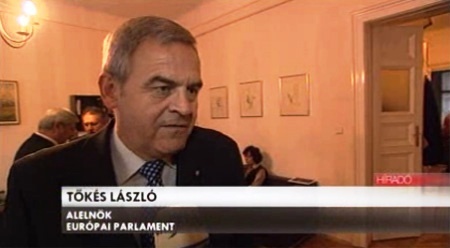 The face of Zoltán Lomnici, the former president of the country’s supreme court, was digitally removed from a news report despite the fact that he was standing directly next to László Tőkés, a Romanian Euro MP of ethnicity who was his co-host at the press conference. Mr Tőkés, a prominent ally of Hungary’s ruling populist-conservative Fidesz party, was quoted extensively in the story. 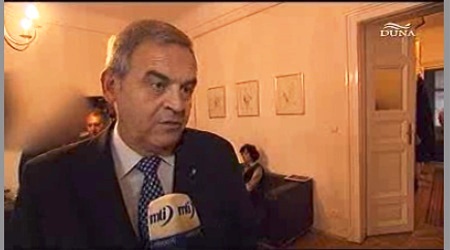 While it has not been suggested that the blurring out of Mr Lomnici from the report was politically motivated — television insiders suggest personal differences between Mr Lomnici and senior management at one of Hungary’s public television stations are to blame — the case does highlight a decline in ethical standards at Hungary’s public broadcasters since the passing of a widely criticised new media law and the reorganisation of public broadcasting last year. In one notorious case last year, Daniel Cohn-Bendit, a French Green who is a prominent critic of the media law, was shown dodging a question relating to allegations about his private life in a news broadcast on Television. It later emerged that the footage had been cut to hide the fact that the Euro MP had in fact answered the question at length. The reporter on that story, Dániel Papp, was later promoted to head of news at Television. The union activists are also protesting against the subsequent handling of the affair: after a swift investigation, the agency in charge of public broadcasting announced it had issued reprimands to three employees, without naming them. It was later reported that the three were the story’s reporter and editor, as well as the news programme’s duty editor. The activists say the three were following a standing order not to show Mr Lomnici in the news, and have pledged to continue their hunger strike until those responsible for that order have been identified. In a statement today, the public broadcasting agency said it would be “patient” in its actions towards hunger strikers. “For now, we are not considering dismissal, because we have no wish to create a martyr out of someone … who is showing signs of losing his sense of judgement,” the agency said in connection with Mr Nagy. Hungary has faced growing criticism from European governments, the US and NGOs over the past year because of its new media law. The law established a media supervisory authority whose board, appointed by the government for a nine-year term, has the right to mete out swingeing fines for ill-defined offences such as “breaching human dignity”. Critics say the threat of being fined under the law has already had a chilling impact on press freedom. is this a case of selective reporting, protecting identities or something more sinister. If you are a person off the street, you are supposed to get the permission of anyone you photograph before you display it publicly. It is interesting how the media is given the right to film whoever they want and broadcast it to millions in the first place.